DVI cable stands for Digital Visual Interface cables that sends Digital or Analog video signals between sources and displays. They are commonly used with notebooks or desktop computers, projectors and computer monitors. 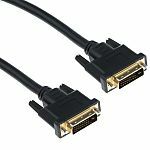 There are different types of DVI connections that look very similar but have different compatibility. Digital Visual Interface - DVI to DVI Cable connects your DVI-equipped computer or other device with a DVI connection, to flat-panel displays, projectors, digital CRT displays, HDTV, monitors, and projectors. What are the different types of DVI cables? The D stands for Digital and carries a digital signal. In comparison DVI-A is an analog signal, you will not be able to use a DVI-D cable with any DVI-A equipment or vice versa duel to the signals incompatibility. The I stands for Integrated and is capable of carrying either a Digital or Analog signal. So it can be used with either DVI-D or DVI-A. 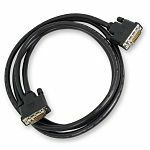 What is a DVI with ferrite core? DVI cables with a ferrite core reduces noise and provide protection against unwanted RFI and EMI interference. Ideal for use with computers, display equipment and audio visual devices to filter out disruption.  DVI-A is capable of a maximum resolution of 1920 x 1080. The pin arrangement features 4 pins around a flat pin and 12 additional pins.  DVI-D Single Link uses a pin arrangement of a single flat pin and two blocks of pins, each with 9 pins. 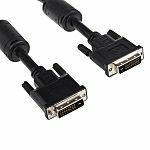  DVI-D Dual Link uses a pin arrangement of a single flat pin and 3 solid rows of 8 pins each.  DVI-I Single Link uses a pin arrangement of a flat pin surrounded by 4 pins and two blocks of pins, each with 9 pins.  DVI-I Dual Link uses a pin arrangement of a single flat pin surrounded by 4 pins and 3 solid rows of 8 pins each.  DVI-D and DVI-I are available in two styles, single link and dual Link. What are the benefits of gold plated DVI cables? 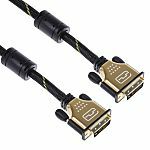 Gold plated DVI cables enhance your HD experience with the ultimate in quality and high-speed connectivity. Designed and engineered to provide premium, broadcast video and sound.